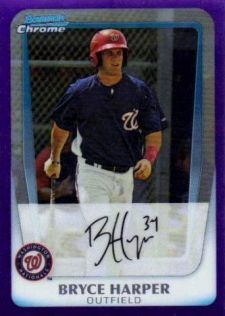 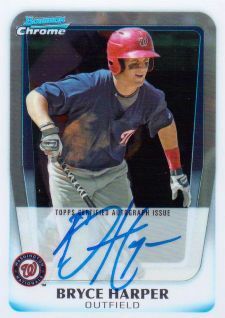 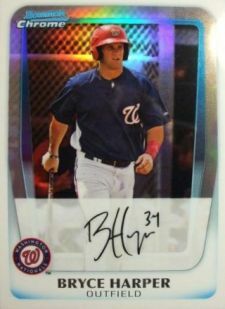 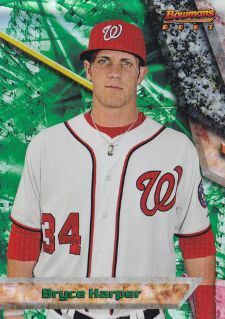 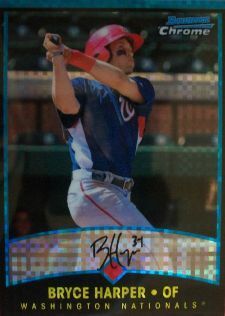 With 2011 Bowman Chrome Baseball hitting shelves, we're going to let Washington Nationals super-prospect, Bryce Harper, guide us through the ins and outs of what to expect with the Prospects cards (because most of us buy Bowman Chrome for the prospecting, not the veterans) in this visual guide. 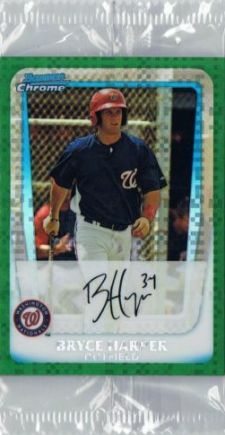 Due to the rarity of some of the cards, we've asked some of Mr. Harper's friends to step in and help fill out the guide. The numbering on the Prospects cards picks up where 2011 Bowman Baseball left off, with numbering running from BCP111 through BCP220. 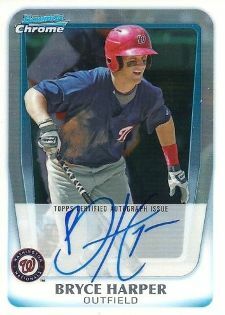 It should be noted that Ryan Tatusko and Gustavo Pierre have cards numbered BCP127 and Steve Cishek has no number. 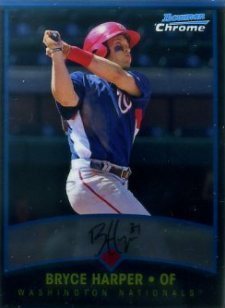 There is noBCP171 in the set. 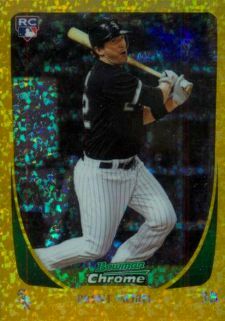 Carrying on from 2011 Bowman Baseball as well, the Bowman's Best Prospect cards carry the 1994 Bowman's Best Baseball design. 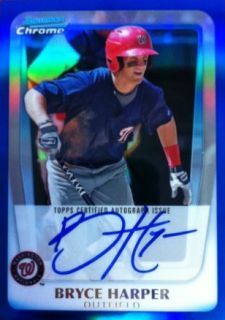 Numbered BBP51 to BBP76, there is some gap in the checklist now as the cards in the base Bowman set were numbers 1 to 25. 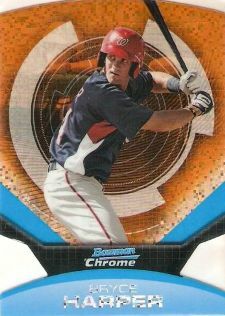 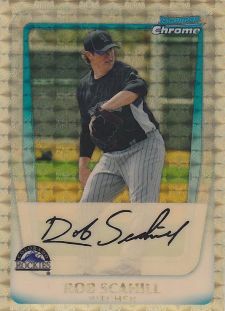 Perhaps 26 to 50 will show up in 2011 Bowman Draft Picks & Prospects. 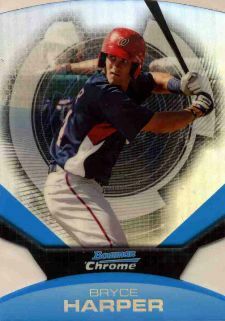 It has been a decade since Albert Pujols had his Bowman Chrome rookie. 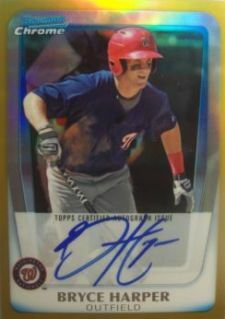 To "celebrate," Topps has put several of today's prospects on the same design. 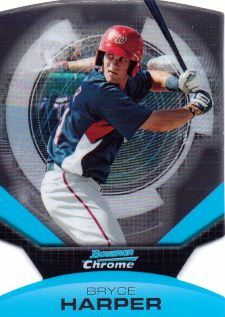 The new insert in the set, 2021 Bowman Chrome Futures cards look forward a decade to predict what Bowman Chrome will look like. 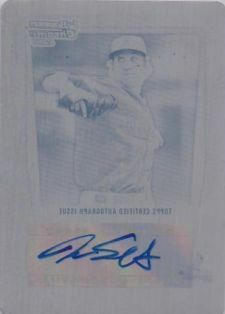 The parallels can be differentiated by the designs in the background. 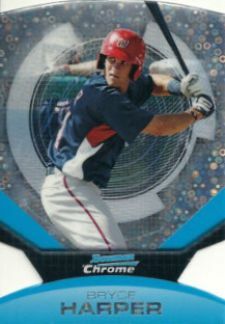 For those familiar with 2000 Pacific Prism Baseball, it's apparently back. 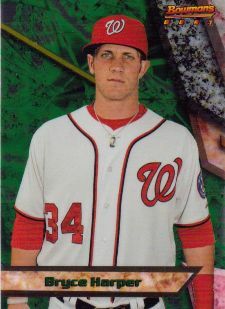 But since they're die-cut, it's forgivable. 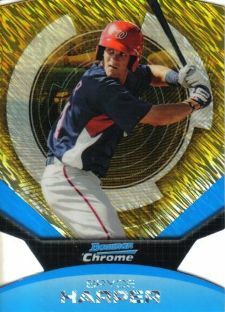 I just received a 2012 Bowman Chrome Gold Refractor, with auto. Bryce Harper, RA-BH. 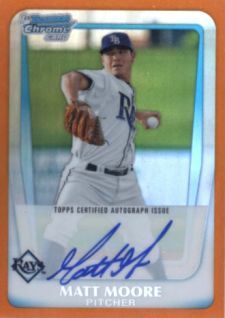 #30/50 I can’t find this card on the net at all. 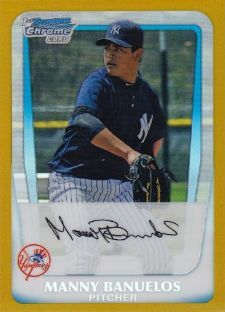 It was a redemption, there are none on Ebay, there never was either. Could you tell me how much I should ask for the card. 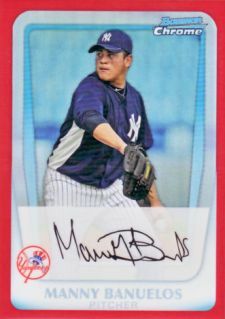 Matt � The redemption cards have been selling for about $400-450.